OC Mom Activities: HURRY! Rapid 24 hour giveaway for Tickets to the OC Fair and Aeromyth! HURRY! Rapid 24 hour giveaway for Tickets to the OC Fair and Aeromyth! Some of my most treasured memories of the Summers growing up as a kid are from going to the county fair! 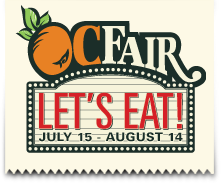 The Orange County Fair is here again! It's full of the favorite foods you love, fantastic music performances at "The Hangar". This year there is everything from We Care Wednesdays (a food drive on July 20th, Children's Book Drive on July 27th, Clothing Drive on August 3rd and School Supply Drive on August 10th), Kid's Day (everything Thursday kids have free admission), Let's Eat for $2 (Taste of Fair Foods noon -4pm every Friday) and Rise & Shine $2 general admission from 10 am - 11 am. The fair runs now through August 14th at the Orange County Fair Grounds (Wednesdays to Sundays). For more information you can go here. I have 4 tickets to giveaway to the performance of Aeromyth at the Hangar on Wednesday! Hurry because this giveaway will only be open until 8pm Tuesday. Please be sure I have a way to reach you so that we can make arrangements to get the tickets to you. The tickets also include free admission to the park in addition to the performance at 8:30pm. Now here's how to enter... let me know what you favorite memory is of the county fair (can be recent or of a county fair you went to as a child). I have some really great memories of the fair. Hot fresh cinnamon rolls and corn still in the husk. Getting all the freebies as we walked through the exhibit. But the best was the year my mom one a first place prize!!! Yeah mom. I would love to win this prize and take my three teenage sons to see Aeromyth. They would be stoked. My best memories are of visiting my grandparents and going to the mid state fair. I loved spending time with them walking through the exhibit halls, eating all the bbq and corn on the cob I could eat. They always took me to musical events that opened my ears to new types of music. I was so lucky to have such wonderful memories with them. My favorite memory of the fair is bringing our son at 18 months old and seeing his eyes light up when he saw the piglets and the goats. He loves visiting all of the animals. He is 3 years old now, and he would love to go again to see them again. Loved going to the LA Fair as a kid - they would pass out free tickets in school and my brothers and I held on tight so we wouldn't lose them. Loved watching the model train display, eating a hotdog on a stick with lemonade and watching the horse races!! Thank you for the chance to win!! Would love to attend the OC Fair! I remember going to Puyallup fair in Washington ever year as a field trip. It was so much fun! My favorite part was seeing all the animals and getting to try fresh milk. I have so many memories from several different fairs. Some of my earliest memories include me dancing on their stages as a young girl (tap dance & Acrobatics). I used to remember getting all dressed up and then after the show running around in all my makeup. Every year I would look foward to snow cones and the fun house. The OC Fair is honestly my favorite fair, and not because it is so close to the south coast plaza. =] Every year we pay to see the big-o horse which my kids love, eat way to much, get a nice shirt tan, and every year I can spend hours looking through the little shops. My husband and I were just talking about the wonderful time with had at the fair when my daughter now age 22 was a young child. She loved the animals and we enjoyed the exhibits. My favorite memory at the Fair was when my wife and I both won awards from the photo competition. It wasn't the winning part that was great, it was hearing her call me up full of excitement to tell me. THAT made for a great day! We didn't have county fairs when we were kids. We just had small local carnivals. I never went to a county fair until I was an adult. I remember the first time I went. It was WOW this is huge!!! After having children my most fond memories are the looks on my girls faces seeing and experienceing all the animals at the fair. They love the pig races and seeing the demonstrations of the cows being milk, bird exhibits and animal shows. I would love to take them again this year. Thanks for the opportunity. Walking around with the kiddos, while letting them take the lead...and at 10oclock in the morning letting them get those absolutely HUGE pickles...i swear they are bigger than my lil ones! My best memomry of the fair was winning a goldfish when I was 6. I dont think the poor fish made it home alive...am pretty sure I remember seeing it floating at the top of the water. My parents said it was just sleeping and sure enough when I came home from school the next day he was alive! I am sure my parents replaced him!! And a recent memory is taking my 3 yr old twins last year for the first time. Sticky faces and hands from cotton candy and huge smiles!! I have so many wonderful memories. Not just as when I was a kid but now more with my children. See their faces light up when we're driving in the parking lot, watching them enjoy all the yummy food, and seeing their smiles while on a ride. It's the best feeling a mother can have! I think my favorite memory at the OC Fair was when my sister volunteered to be hypnotized on stage. So funny. You can always count on a good show at the fair. My favorite memory is going to the state fair with my parents in the 80's. They surprised me with my first concert of my favorite band Huey Lewis and the news. He did not disappoint,especially every time he turned around in his black jeans. Love watching my kids enjoy all the fair has to offer. Best memories of all...being with them. I remember going with my brother when I was little, and he finally convinced me to go on an upside down ride-I was scared out of my mind, but after it was over wanted to do it again, and have loved fast rides ever since. I think my favorite memory is from when I was little, walking around the fair grounds with my family, spending time together and enjoying the exhibits. I especially loved to look at them with my sissy (grabbing freebies & stickers and such). We would love to take our treasures home and see how we could use them to play "school" or something make believe- So fun! One of my great memories is when my husband & I first started dating, we went to the fair and sampled all the yummy fair food. I had never done that before and it was a lot of fun! We love the OC Fair and have great memories of the Fair. Some of my greatest memories are of my 5 year old son at the fair and seeing his eyes light up with excitment as he pets the animals at the petting zoo or watches the magic show under the tent. Last year when my husband won him the stuffed bear he really wanted, that just made his day! We would love to be choosen to be able to take him again this year. I absolutely LOVE the fair. All of the wonder food, music and rides. I love trying all the different deep fried items. It's the one time a year that you can eat anything and not feel guilty. Hahaha. I have never been to a concert at the fair so this prize would be awesome. Hope I win. Thanks for the opportunity. My favorite fair memory would have to be now, as a mother, just watching our children enjoy the same experiences my husband and I did as a children. We love to share with them all the things we enjoyed and make our old memories come to life again through our girls. Thank you for the opportunity to win tickets. My favorite memory was winning 3rd last year in the photo competition - hubby won 1st, so it was a great fair experience! Also love the chocolate covered licorice! It's the best!! My children love to go and see all the animals. They always find something intersting and new to them. When I was a kid going to the fair was a really big treat. I was so amazed by all the different foods and goodies. All the different shows/exhibits were always fun to see. But the thing I loved the most was being able to see and sometimes pet all the different animals. I am grateful that I can continue to share my experiences I had as a kid with my own kids. Our family has an ongoing memory that my husband and I started the first time we went to the OC Fair as a couple over 16 years ago. The first time we went we got the pictures taken in the black and white photo booth. We have been back together every year since and have taken the pics, of course adding each of our three girls!! It is so neat to have this tradition and of course to see all of the pics as the years go by. Good times!! I heart the OC FAIR!! I have fun memories of the fair where I lived as a child. It was just such a fun atmosphere with so many fun things to do and see. The highlights for me were the pig races and the funnel cake! The Demolition Derby is a family favorite at the fair. I have loved watching my kids get so excited cheering the cars on as they get crushed.